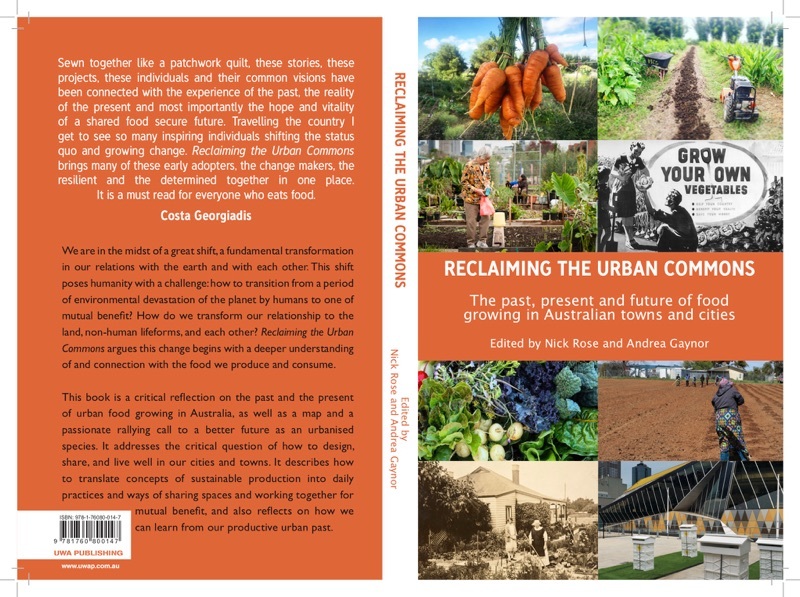 This book is a critical reflection on the past and the present of urban food growing in Australia, as well as a map and a passionate rallying call to a better future as an urbanised species. It addresses the critical question of how to design, share, and live well in our cities and towns. It describes how to translate concepts of sustainable production into daily practices and ways of sharing spaces and working together for mutual benefit, and also reflects on how we can learn from our productive urban past. 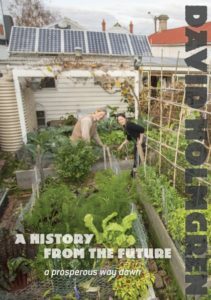 David Holmgren’s chapter is Garden Farming: The Foundation for Agriculturally Productive Cities and Towns. Australian suburbs can be transformed into productive, resilient and sustainable places to live through garden farming. Growing food right where people live, in back and front yards, has environmental, social and psychological benefits. Garden farming in the household, non-monetary economy is complementary to commercial urban and peri-urban agriculture that, collectively, can be the heart of a resilient bio-regional food system. This website and all its posts are devoted to my permaculture life and work committed to creating the world we want. It is solution- and good news-focused. But my life’s work has always been informed by a rational understanding of the intensely political world we live in. Longer-term readers may have noticed that in recent years some of my writing has focused more explicitly on exploring the underlying nature of the problems we face to show why permaculture is a real strategy for addressing more than just personal well-being with a low ecological footprint. For instance in ‘Money vs Fossil Energy: The battle for control of the world’ (2010, dedicated to the memory of my brother Gerard Holmgren) I used the ecological systems thinking that underpins permaculture to provide new insights and understandings of the titanic changes occurring as industrial civilisation collides with the limits to growth. ‘The Household Level Counts’ (2013) was a brief and early articulation of why permaculture design, activism and living should be taken seriously as a social and political change strategy. This underpins my focus on the household level in RetroSuburbia. ‘Crash on Demand: welcome to the Brown Tech future’ (2013) built on my Future Scenarios work (futurescenarios.org) and represented a further step into the role of positive provocateur in the debate about what constitutes effective environmental activism in a world of climate chaos and repressive governance. These and other writings are currently being reviewed in preparation for the digital publication of the third volume of my Collected Writings that will include essays, reviews, obituaries and presentations from 2007 to 2018. As a package with the previous editions, it will mark 40 years of writings since 1978, the year Permaculture One was published. 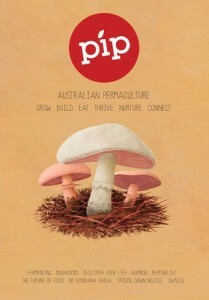 Inevitably, this retrospective consideration brings up the claim that permaculture may well be Australia’s greatest intellectual export – driven by the warrior energy of Bill Mollison. People who know me, or my writing, will know my scepticism of the warrior energy and its limitations in creating the world we want. However that scepticism does not take away from my appreciation and respect for what has been achieved by warriors devoted to true and noble “causes” (as my political activist mother called movements for social justice and ecological sustainability). Which brings me to Julian Assange, languishing in a unique form of detention in London and now under imminent threat of ejection into the fire of US imprisonment or worse. 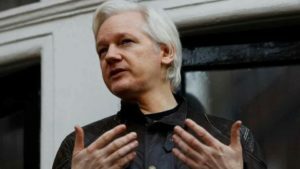 His treatment by national governments has been appalling, especially the US and the UK, but also Sweden (previously a symbol of fairness and good governance), Ecuador (plucky protector now succumbing to pressure), and Australia (meekly standing by while our fellow Australian is tried and found guilty by politicians and the pack of media hacks who resent Assange for showing up their own failures to shine a light into the backrooms of power). Assange, the technical brains, publicist and warrior behind Wikileaks could, for all I know, share some of Mollison’s personality flaws, but even if the worst of the claims about his personality are true, none of them take away from Assange being the most globally important independent journalist and publisher using the power of the internet to challenge the rapid rise in authoritarian power and propagandised media. That Assange is being treated as the sacrificial pawn in the chess game being played out in Washington around the fabricated Russia hysteria highlights the power of people creatively working outside of centralised systems. By promoting Mollison and Assange as equally great Australians who have contributed to a better world, I may alienate some people for whom Mollison is a hero but regard Assange with suspicion or even as a “traitor” deserving whatever happens to him. This is a risk I am willing to take, especially as Mollison’s contribution is now a secure legacy whereas Assange’s is still unfolding but under mortal threat. We should do all in our power to bring Julian Assange home to recover from his ordeal of these years – with no expectations about what he might contribute in the future. His sacrifice for shining the spotlight on the power behind the mask of representative democracy, and providing the inspiration for younger people to use the tools and capacities they have at hand to create the world they want now, has already been too great. Heartwood by Rowan Reid is a heartfelt story by one of the pioneers of blending forestry and farming in this country over the last 30 years. His story is told through chapters focused on tree species planted on his farm at Bambra in the Otway Ranges of Victoria. 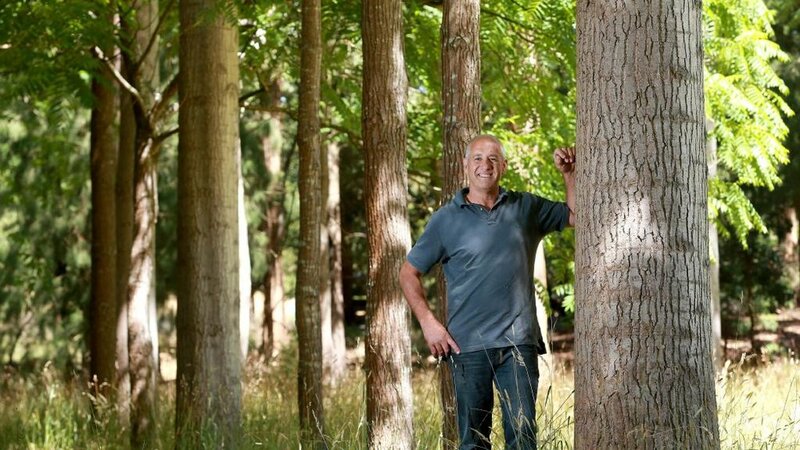 While this is a personal story focused at Bambra, Reid draws on his decades of experience teaching forestry at Melbourne University, facilitating farmer initiated tree growing through the Master Tree Growers courses and his local Otway Agroforestry Network. In Call of the Reed Warbler Charles Massy says that “Rowan Reid has dedicated much of his life to addressing the key area of increasing the knowledge, resources and confidence for farmers engaging in agroforestry. Along the way he has helped redefine the very concept of farm forestry”. This beautifully produced book records the trees and the learnings that mark that life. Each story is complemented by brief but informative science and practice pieces that provide the reader with knowledge to help shape their own tree growing journey. For those applying permaculture ethics and principles to growing trees for timber, Heartwood is one of the most inspiring and informative books about the subject, even if the only reference to permaculture is a passing one. Reid’s journey as a forester amongst farmers, from youthful vision, applying science and trial and error, to teaching and collaborating across communities and landscapes is a remarkable one of achievement and lessons learnt. His major theme is that conservation and production are compatible and complementary rather than contradictory. Like my own early co-authorship of Permaculture One (1978), Reid’s co-authorship of Agroforestry in Australia (1985) saw him driven to put into practice ideas outlined in that book. Even though integration of conservation and production values was taken for granted by the permaculture, agroforestry and landcare pioneers, this vision was corrupted by a number factors. Reid’s stories illustrated how the war over native forests as well as government sponsored Landcare programmes both contributed to the segregation of trees for nature from those for profit. Reid’s stalwart stand against this dysfunction and lost potential for transformation of our broadscale farm landscapes by more widespread tree planting for multiple values is clear through the book, but this is not the primary message of all his stories. They all show that the rewards to those with the passion and persistence in tree growing have been economic, environmental and emotional, despite the continuing dysfunction in this country’s relationship to forests and forestry. My own passion for sustainable forestry over the decades since Permaculture One has been diluted by my jack-of-all-trades spread across the vast territory that is permaculture. 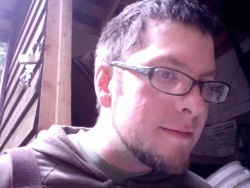 Apart from his focus as more of a master-of-one, Rowan Reid has also used the resources and opportunities of his position as a teacher in one of the few Australian university forestry schools to leverage his vision and trials with scientific evidence that has been mostly lacking for those of us who have worked outside of the system. Although we have known of each other’s work from early days, our paths have rarely crossed. I found myself in heartfelt and at time furious agreement with most of Rowan’s stories and lessons, especially his examples of sustainable management of regrowth native forest by innovative land holders. His learnings in choosing native and exotic species at Bambra reinforced my own experience and observations, especially with Coast Redwood. I also had many a-ha moments as Rowan explains how trees grow and the effects of different management, much of it based on recent science by his colleagues and students. Some permaculture folk might begrudge Reid’s failure to acknowledge permaculture as a broader conceptual framework for what he has demonstrated, but I know that Reid’s innovative work may have had less influence by being associated with permaculture through the dark decades of the 80s, 90s and 2000s. Hopefully those days are passing with both Reid and myself being included in Massy’s influential book about ecological land use in this country. The only point of strong difference for me was his reinforcing of the nativist orthodoxy that naturalising willows are bad for the environment. Sometime I imaging having a long discussion with Rowan, and our mutual friend and long time closet permie Jason Alexandra about willows. The science about naturalising species is certainly open to on-going debate and many of Rowan’s stories illustrate how scientific evidence has been a constant factor in refining and redirecting his practice and teaching. But Heartwood is also a beautiful illustration of how passion, intuition, happenstance and art have been important factors in Rowan Reid’s life’s work with trees. You can buy Heartwood from our online store. We are thrilled to be sharing with you an excerpt from David Holmgren’s A History from the Future – a prelude to his upcoming book RetroSuburbia. Long time central Victorian resident and co-originator of the globally influential permaculture concept, David Holmgren draws on his Future Scenarios work to paint a picture of how simple household and community level strategies can build resilience to the hard emerging realities of economic contraction, peak oil and climate change. 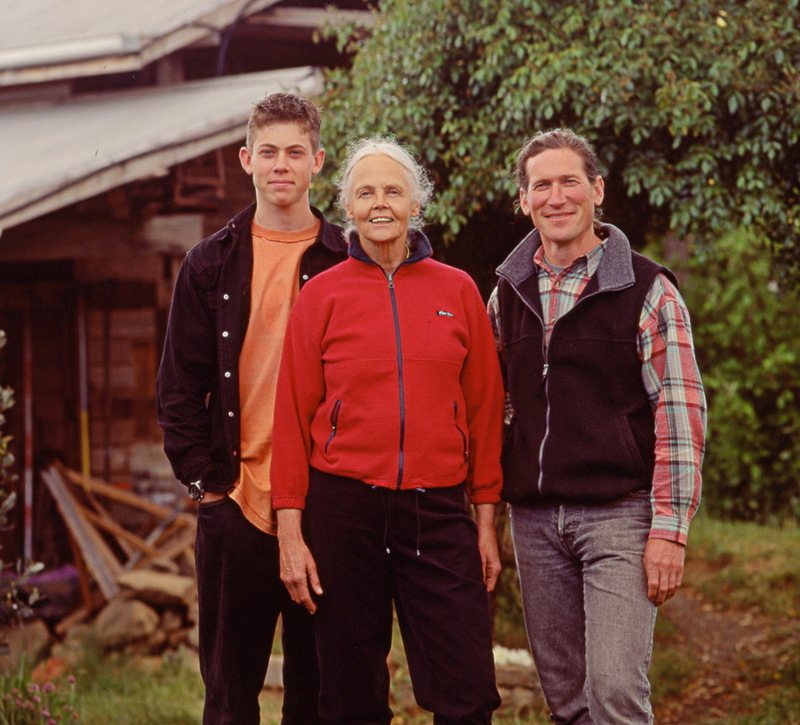 Holmgren has spent decades modelling how low impact resilient ways of living and land use provide a happier and healthier alternative to dependent consumerism. In this story, based on an original presentation from the Local Lives Global Matters conference in Castlemaine 2015, he shows how these informed lifestyle choices and biological solutions become the basis for surfing the downslope of the emerging energy descent future. At the turn of the 21st century the evidence for energy descent driven by peak oil and climate change was already strong. The quasi religious belief in continuous economic growth had a strong hold on collective psychology in central Victoria as much as anywhere in the world. The global financial system began to unravel in 2008 at the same time that global production of conventional oil peaked. For a minority it was increasingly obvious that the policies put in place ensured that the collapse was even more severe when it did come. It was like the powers that be had pushed the accelerator hard to the floor in one of those supercharged sports cars of the time, to attempt to jump across the widening chasm that humanity was facing. The collapse of global financial growth unfolded differently in different places but here the story had many upsides that were partly due to luck and partly a result of visionaries and innovators who helped create a better future. These are the bare bones of how we got from what a few people still consider was the golden age to what we call the Earth Steward culture. In 2017 the Australian property bubble burst. For our communities, this marked the start of the First Energy Descent Crisis (of the 21st century). Ballarat Bank was the first financial institution to fail and a government forced take over by the Commonwealth Bank saw the Community Bank network hived off as local lending co-ops backed by local government hoping to restart economic activity in regional towns that were increasingly on their own as State and Federal governments focused on dealing with hardship and social unrest in the cities. The crisis was world wide, so dramatically reduced global Greenhouse Gas Emissions and the peak of global oil (what they called Total Liquids at the time) the same year was very much in line with the 1972 Limits To Growth report default scenario showing industrial output peaking about that time. More recent studies suggest that net energy available to support humanity peaked closer to the turn of the millennium but it’s all a moot point because it seems that economic growth had been a net drain on human welfare for decades before that. As capital investment in oil fell off a cliff, and production from existing fields declined at nearly 10% there was a second oil price shock, a US currency collapse and a short war between the USA and China in 2022. Australia got punished in the trade embargo imposed by China. The economic crisis in China had already caused nearly 100 million of the recently urbanised workers to return to the villages, and reimposition of a command economy to continue the shift to renewable energy and revitalise agriculture. Consequently China was able to cope without Australian coal and gas and there was so much scrap steel in the world that the iron ore exports had come to a standstill. While oil and food remained costly (at least relative to falling wages) most manufactured goods were dirt-cheap. Solar panels from China (somehow getting around the trade embargo) accelerated the trend for retail customers going off grid which, combined with collapse of commercial demand for electricity, led to a “Death Spiral” in the power grid with rising prices and increasing blackouts (and surges due to excess wind and solar inputs). 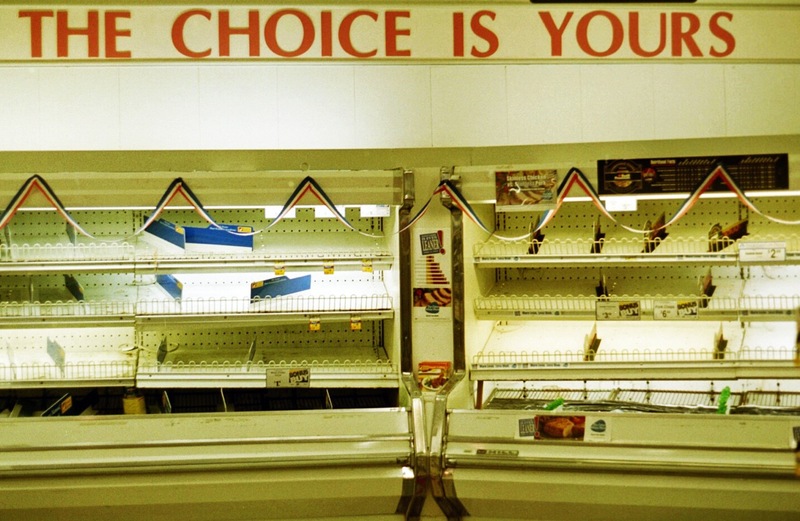 A newly elected Federal Labor government renationalised the power grid, along with price controls, rationing an Australia ID card allowing rationed access to subsidised supermarkets that had been experiencing shortages of fresh fruit, vegetables and dairy. In Victoria, a Liberal government implemented policies to encourage people to be more self-reliant. Permaculture education was adopted as a framework for integrating aspects of self-reliance including home food production, owner building, water harvesting and waste management. 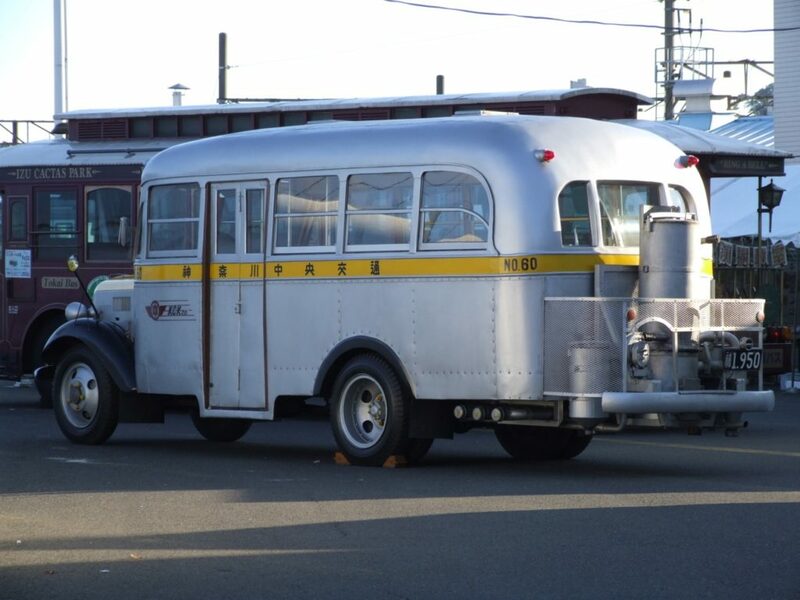 Rationing of fuel led to hitch-hiking, ride sharing and in rural areas a rush to convert vehicles to wood gas. Bicycles became the default personal transport around town in Castlemanine but in Daylesford and Hepburn, electric bikes and vehicles powered by the Hepburn Wind charging stations installed for tourists before the property bubble burst maintained mobility for locals. Conversion of vehicles to wood gas by a range of bush mechanics and ex-hot rodders had mixed success. The market value of higher powered larger vehicles and trucks rose as a result of the first wave of conversions. The Castlemaine Obtainium Engineering Institute was established to test and improve local designs and prototypes. One of the motivations was a competitive spirit with the electric car networks centred in Daylesford and Ballarat. Use of Bitcoin (a virtual currency), local currencies, precious metals and barter all increased to support exchange in the rapidly growing informal and grey economies. Bitcoin then failed in mysterious circumstances after being targeted for funding terrorism. The Internet began functioning again after major breakdowns during the conflict between the US and China. But Facebook and Amazon were bankrupt, cyberspace was littered with defunct and unmaintained sites and Internet marketing was plagued by cyber crime and draconian government regulations. Local computer networks using wireless technology, as well as a revival of two-way radio, started building back to basics communication pathways. 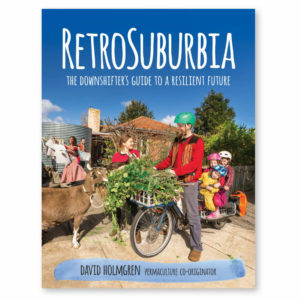 To read the full story, purchase the eBook here or get the download for FREE when you sign up to our mailing list for updates to David Holmgren’s upcoming book RetroSuburbia, due for release in March 2017. 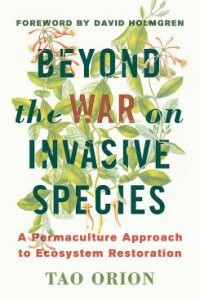 Beyond the WAR on invasive species: A Permaculture Approach to Ecosystem Restoration is a new book by Tao Orion published by Chelsea Green. Beyond the WAR on Invasive Species offers a much-needed alternative perspective on invasive species and the best practices for their management based on a holistic, permaculture-inspired framework. Utilizing the latest research and thinking on the changing nature of ecological systems, Beyond the WAR on Invasive Species closely examines the factors that are largely missing from the common conceptions of invasive species, including how the colliding effects of climate change, habitat destruction, and changes in land use and management contribute to their proliferation. The choices we make on a daily basis—the ways we procure food, shelter, water, medicine, and transportation—are the major drivers of contemporary changes in ecosystem structure and function; therefore, deep and long-lasting ecological restoration outcomes will come not just from eliminating invasive species, but through conscientious redesign of these production systems. Here’s what David Holmgren reckons how this war began and now entrenches us, deep in the environmental conscience. This new science of “Invasion ecology” informed the education of a cadre of natural resource management professionals, supported by taxpayer funds. These resources mobilised armies of volunteers in aʻwar on weedsʼ. But labour and even machine intensive methods of weed control were soon sidelined in favour of herbicides that environmentalists and ecologists accepted as a necessary evil in the vain hope of winning the war against an endless array of newly naturalizing species. For the chemical corporations this new and rapidly expanding market began to rival the use of herbicides by farmers, with almost unlimited growth potential, so long as the taxpayer remained convinced that the war on weeds constituted looking after the environment. In Australia the visionary grassroots Landcare movement, started by farmers in the early 1980s, was reduced to being the vehicle for implementing this war on weeds. 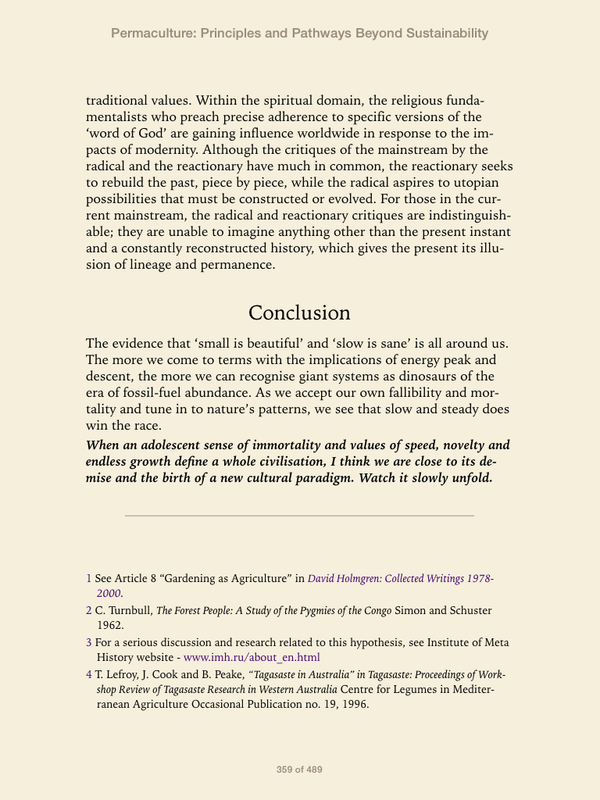 Read in full, David Holmgren’s foreword to the book, here(PDF). The world has changed radically since Permaculture: Principles & Pathways Beyond Sustainability (PP&PBS) was first published in 2002. By many environmental, economic and social measures, local communities and global systems are now in crisis and even collapse. The premise of the book was that the ‘energy descent’ future would inevitably require new ways of thinking to replace the failing principles that guided industrialisation, modernity and globalisation. In reflecting on the book, I remain happy with the eclectic mix of abstract theory, grounded examples and personal anecdotes that riled academic and editorial sensibilities. While some ideas and points remain speculative, many others have since become clearer through the course of a growing body of practice and more than a decade of turbulent world history that we have lived through. For example, for the well-informed, Peak Oil has moved from speculative concept to historical reality that underpins the explosive growth in renewable energy, economic contraction and geopolitical realignment. Similarly, the environmentally heretical positive view of species naturalisation that I articulated in the book, is now supported by a rapidly growing body of peer reviewed science within the new field of study of ‘novel ecosystems’. The delay in producing an eBook version of the text (not having a publisher driven by financial logic) has been fortuitous because it has allowed a comprehensive review of the text to improve grammar, use of terms, and an update and the addition of references. Most importantly the capacities of a digital edition enabled live links to updated web addresses and direct cross referencing to precise points in the text rather than general chapter references. This allows the reader, including those who have read the printed book, to explore in more depth the non-linear nature of systems thinking that accounts for at least some of the difficulty of this work. The fully searchable text allows the reader to easily find a point that this labyrinthian character tends to hide. Now searchable, making it much easier to find what you are looking for. Updated colour icons included for the design principles and ethics. With colour images, bringing the original book to life. Has colour images added, bringing the original book to life. Includes footnotes that link and direct cross referencing to precise points in the text rather than general chapter references. Includes updated references and website links. Readers of existing translations can be assured that the changes made are of a minor in nature compared to the great difficulty in translation generally and especially for this work. We trust that the painstaking translation work, by those with an understanding of and commitment to the concepts, has captured the text for the better but we hope the text of this digital edition will make any future translations a little easier. As ever I remain one of permaculture’s strongest internal critics in insisting that for permaculture concepts and teaching to remain relevant, it must be grounded in practical action that regenerates nature and improves the lives of ordinary and especially impoverished people. In addition, it must remain open to influence from parallel and complementary concepts, movements and ideas that are contributing to a gentler and more benign energy descent future in which nature’s wealth is regenerated and humanity finds its place in that natural order. 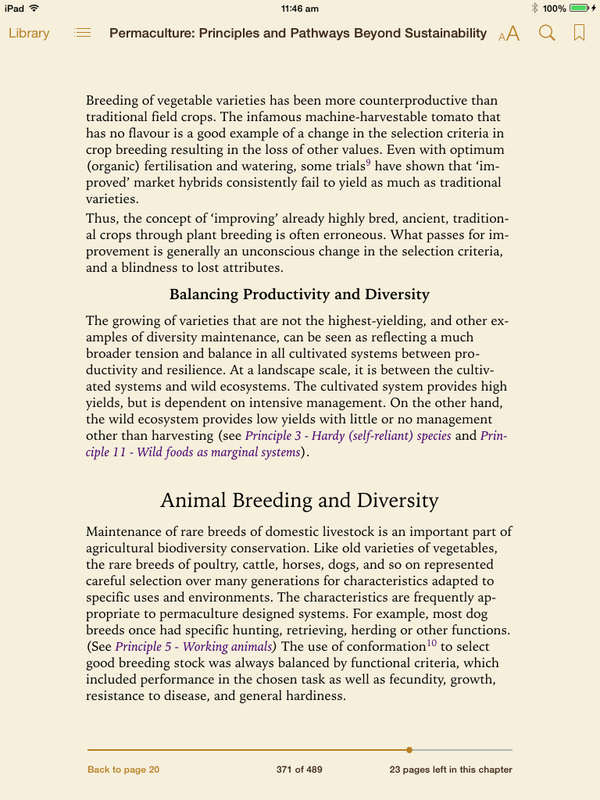 Permaculture: Principles & Pathways Beyond Sustainability eBook is now available as an ePub for AUD$20. The ePub file download can be opened and read on most modern smart phones, tablets and desktop computers using appropriate software, like iBooks for Apple users. While gardening alone in the Spring busy period without the need to plan and direct volunteers, I have had more time for reflection. One of the subjects for reflection was my elevation to the Green Lifestyle Hall of Fame. By chance I had just read a series of articles by Kari McGregor (part 1, part 2 and part 3) using a framework for thinking about green activism that seemed relevant to this award. Kari McGregor’s categories of environmentalism Light Green, Bright Green, Deep Green and Dark Green made sense of my musings. Light Green, is about relatively modest changes in our personal lifestyles that will collectively lead to a more environmentally sane and sustainable society. Bright Green, is based on a belief that renewable and smart technology will create the next industrial revolution that will allow society to continue the path of progress that is so fundamental to our collective culture. Both these strains of environmentalism remain anthropocentric while Deep and Dark Green environmentalism assert humanity must develop an eco-centric culture to survive. Deep Green environmentalists focus on protecting nature by direct action and radical political activism while Dark Greens focus on building the ecological successor culture now in the belief that industrial civilization is doomed to run its course and collapse either dramatically or slowly. In this framework Green Lifestyle Magazine is primarily Light Green with a fair dose of Bright Green. I wondered where to position the previous recipients of the Hall of Fame award. Bob Brown might be more Deep Green while Olivia Newton John’s stellar celebrity and financial success might suggest a blend of Light and Bright Green (even though I know very little of her environmental activism). I fit more squarely in with the Dark Greens. While my Dark Green perspective may seem most removed from Green Lifestyle’s Light Green environmentalism, we share the focus on change the world by changing ourselves while the Bright Green renewable energy and climate policy activists such as Mark Descendorf, and Philip Sutton share the belief in changing the nature of the system with the more radical direct action activists such as Paul Watson (founder of Sea Shepherd) even if the methods used to bring about structural change are very different and that these activists can be placed on either side of the anthropocentric and eco-centric divide. The point of Kari’s essay was that all four perspectives have their strengths and weaknesses and that we should all do more to acknowledge the value of the perspectives. She suggests that commitment to social justice is a shared if not strongly articulated value behind all four shades of green that could be more strongly recognized and articulated. In this context I thought about how new PIP magazine which I have strongly supported is just a slightly more radical version of the Light Green environmentalism on show in Green Lifestyle mag. Permaculture as a brand of Australian environmentalism does focus on what we can do to look after the environment and future generations as we become more self reliant, productive and resilient individually, in our households and communities. Maybe permaculture can be viewed as a low eco-tech version of Bright Green that will allow us to live fulfilled lives without today’s systems or consumption of resources. But my Future Scenarios work let alone my more recent controversial essay Crash on Demand; Welcome to the Brown Tech World have suggested to some that I have shifted from optimist to pessimist about the future of humanity. I don’t think my perspective has shifted that much other than a response to what I see as the declining options available to future generations as industrial civilization accelerates toward a collision with nature and its internal contradictions. In many ways Crash on Demand is a strong Dark Green critique of the Bright Green and Deep Green perspectives while I largely ignore the Light Green perspective as being far to weak a response to the ecological crisis. Kari’s framework certainly helped me make sense of Green Lifestyle magazine’s award to me. As co-originator of the permaculture concept I was partly responsible for the positive can-do attitude to improving the environment, that is permaculture. My lifestyle of radical simplicity combined with household and communitarian sufficiency, is an uncomfortable one for most trying to do their bit to live a greener lifestyle. Compared to the two previous recipients of this award, Bob Brown and Olivia Newton John, I am definitely more of an extremist. Still, I thought, it is normal in any network or subculture to look to radicals rather than moderates for inspiration. We acknowledge and respect those who go the extra mile to “walk the talk” even if that means a stronger ideological commitment or pig headed personality than most in the same subculture would believe reasonable. Beyond this recognition of pioneering radicals, I thought my permaculture lifestyle of radical simplicity and sufficiency is more in line with mainstream consumer environmentalism than it is with mainstream political environmentalism. In the debate about the personal being political vs structural change to the “system” I obviously more associate with the first view while Bob Brown has devoted his life more to the second perspective which is characteristic of Kari’s Bright and Deep Green environmentalisms. Viewed through this lens my Crash On Demand essay is actually an appeal to all environmentalists to take seriously the idea that what we do in our own lives is potent but only if what we do is radical in its simplicity and abundant in its real biological and communitarian productivity. Thus there is a direct line of evolution of action from Light Green to Dark Green. I doubt whether Kari’s framework let alone my musings reflect the decisions of the judges at Green Lifestyle Mag but this award and Kari’s framework has certainly reminded me that all responses to the ecological crisis have value in ways that are not necessarily obvious. 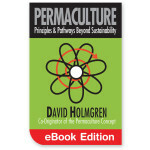 We are proud to announce that the release of the Chinese language edition of Permaculture: Principles and Pathways Beyond Sustainability by David Holmgren is imminent. To give you a sneak preview, here is the prologue to the edition prepared by David. First in Chinese, and then in English to follow. 《探索樸門：超越永續的原則與道路》here we come. Any enquiries, please mail 大地旅人慧儀 <[email protected]>. The copies are available here. 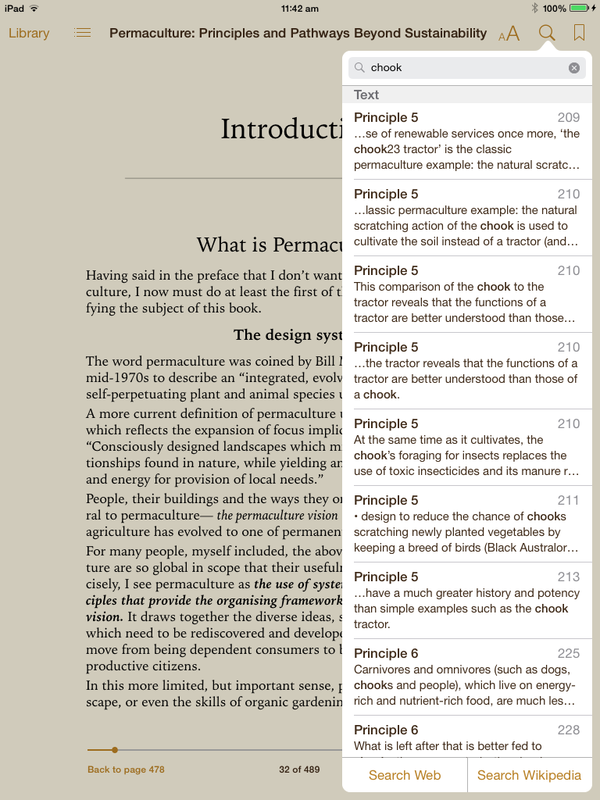 The world has changed radically in the 12 years since the publication of Permaculture: Principles & Pathways Beyond Sustainability in English. By many environmental, economic and social measures, local communities and global systems are in crisis and even collapse. The premise of this book that “the energy descent” future will inevitably require new ways of thinking to replace the now failing principles that have guided industralisation, modernity and globalisation. Permaculture is at the forefront of this creative response to energy descent because it is based on ethics and design principles that have evolved and been tested over the decades since the evidence for the energy descent future first became clear. Permaculture will not help save the world as we know it, but it can inspire and inform a multitude of creative responses to the world that is emerging. It is not surprising that permaculture has its origin and longest history in Australia and other long affluent English speaking countries where there has been more time for (a still small minority) to understand the “limits to growth” dilemma and begin developing and adopting the alternative ways of landuse and living that will be viable in the energy descent future. In the Chinese speaking world, Taiwan, Hong Kong and Singapore have naturally been the places where awareness of the “limits to growth” and the alternatives have been first to emerge after rapid economic growth created the best and worst outcomes of rapid industrialisation, urbanisation and consumer culture. The very recent nature of explosive growth in mainland China provides new opportunities for the emergence and spread of post growth ideas. The unsustainability of these systems and the likelihood that much of the growth has been driven by bubble economics, provides opportunities for alternative responses to spread rapidly once the bubble bursts. 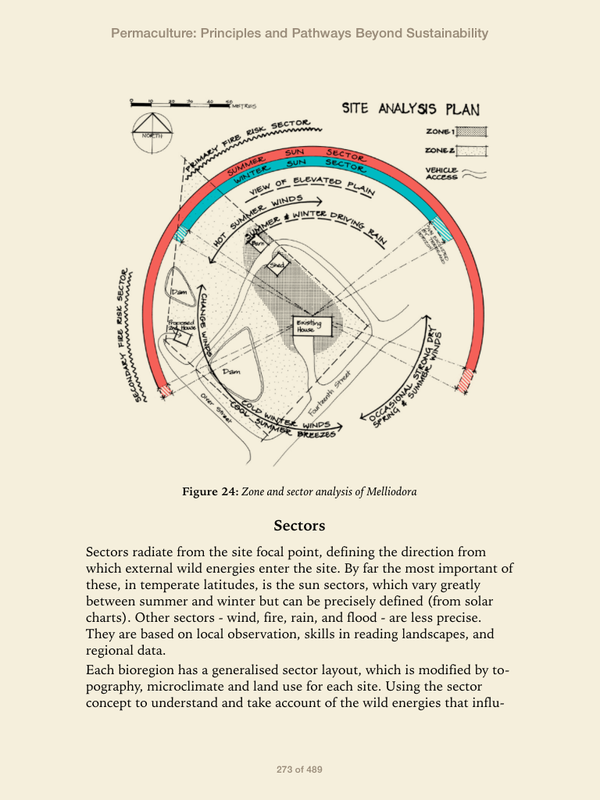 For those already on the path of searching for creative ecological design solutions to the dilemmas of energy descent, permaculture ethics and design principles are thinking tools that help find, evaluate, refine and create from “first principles” the strategies and techniques that are appropriate to each and every situation from the most remote provences to the newest cities. Those design solutions will be some hybrid between modern ecological design and traditional wisdom and ways of living that sustained people and nations before the fossil fuel powered era. While population density is a serious challenge, there are some advantages for the rapid spread and evolution of permaculture in the Chinese speaking world. Firstly the radical political, economic and social changes of recent decades have made people very adaptable and able to consider new ideas. Many of those new ideas (like permaculture) come from the western world but few encourage people to rediscover the wisdom of traditional systems of sustainable landuse and ways of living. The very recent nature of affluence and urbanisation, especially in mainland China means there are many places where people still have a working knowledge of low impact ways of growing food, working with nature, building houses, repairing old possessions rather than buying new ones, and the many other activities associated with more self-reliant and communitarian ways of living that existed before the fossil fuel powered global boom. This is a great strength compared with many long affluent countries such as Australia where many of these skills have been lost generations ago. 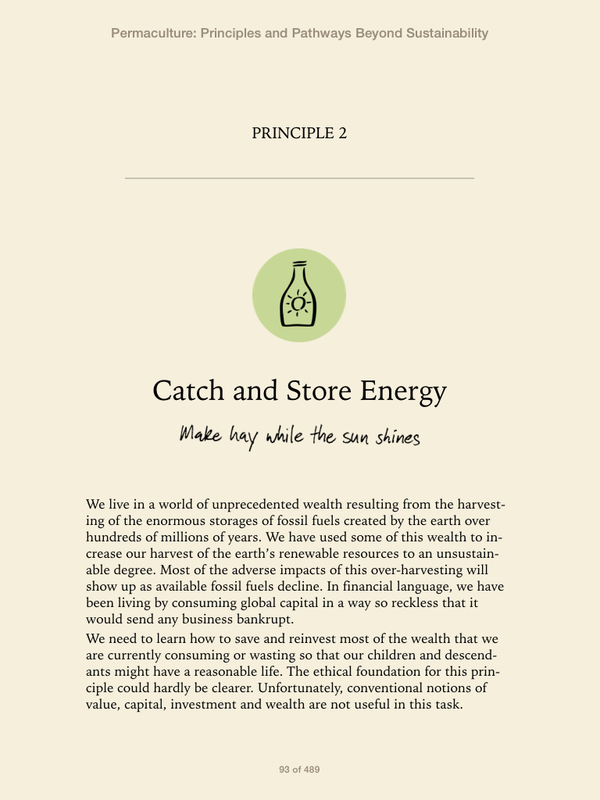 Rather than a retreat to the past, permaculture ethics and design principles help us sort the “wheat from the chaff” of both tradition and modernity for a prosperous way down in the energy descent future. I trust that the publication of this book in Chinese will lead many people to permaculture and for that I want thank the publishers Hui-I Chiang (江慧儀) of Earth Passengers (大地旅人環境教育工作室) and Taiwan Permaculture Institute (台灣樸門永續設計學會) for translation as well as Rick Tanaka at Holmgren Design for facilitation of the process. I was recently asked by “permaculture actionary” Delvin Solkinson to provide some words for a newsletter promoting the next Rainbow Serpent Festival at which I’ll be speaking (several times). Very normal that a previous participant at one of our Advanced Permaculture Principles Courses should be asking me for a piece for an event he has the job to promote. Except for the fact that Delvin is based in the rainforests of British Columbia, Canada and the event is Rainbow Serpent Festival, that is held each dry dusty January in our bioregional backyard. Inevitably I said too much for Delvin to use in full, but he thought it should be available somewhere, so here it is. What are the roots or foundations of Permaculture? Permaculture emerged from the fusion and ferment of environmental thinking of the 1970’s. It can be thought of as applied systems ecology with a strong debt to the work of Howard Odum. In another sense it was a branch of the tree of organic agriculture, with roots in many industrialised countries, in the early 20th century informed by pioneering work on sustainable agriculture by F.H. King who wrote Farmers of Forty Centuries; Permanent Agriculture in China, Japan and Korea. The emphasis on perennial plants, especially trees, was strongly informed by Russell Smiths Tree Crops; A Permanent Agriculture and the resurgence in interest in Economic Botany (useful plants), and indigenous use of plants and land management. As a social movement permaculture originated in the Counterculture applying an activist strategy to create the world we wanted rather than fighting to stop the world we didn’t want. Early “back to the land” self sufficiency efforts outside the mainstream economy provided a context for early application of permaculture concepts. Although not overtly political, permaculture was influenced by both Anarchist and Libertarian philosophies. What is the best way to become a permaculture actionary or ‘get on the ground’ ? 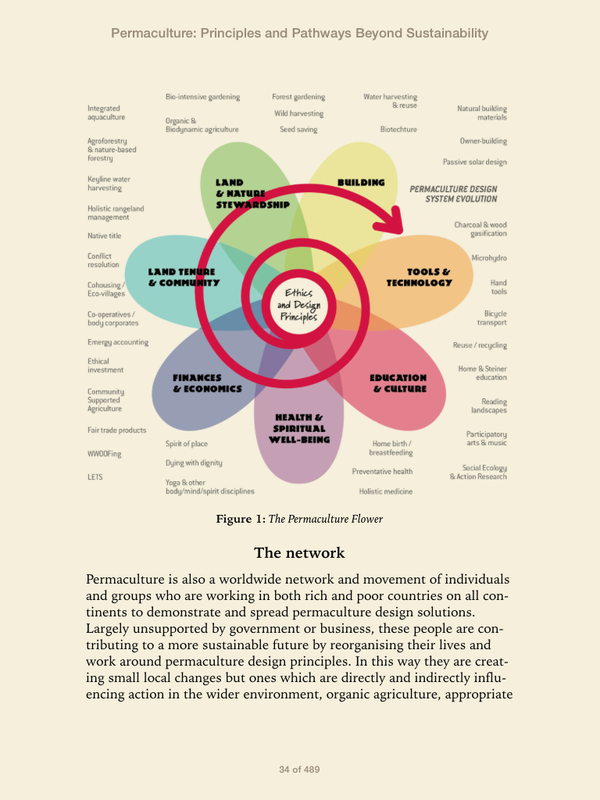 There are many different entry points to becoming a “permaculture actionary”. For some it starts with books, for others it is social and practical immersion without over intellectualizing, for many it is a Permaculture Design Course. Whatever the starting point, it should become clear that the most important application of permaculture ethics and principles is to the self, through a process of self audit of our needs, wants, dependencies, creative and productive outputs and byproducts of our very existence. Getting grounded in this way is the start of a personal retro-fit or redesign process which does not require that we wait until we own land or are with the right crowd. We can be our own guinea pigs in creating a better world. It is not necessary to tell the whole world first up but it certainly helps to connect with like-minded people for ideas and inspiration in building skills and capacities to help ourselves and others adapt to a rapidly changing world. What is the future of permaculture that you would most like to see? 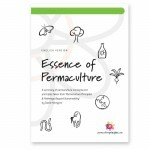 My hopes for permaculture range from the most general to the most specific. As a concept I hope it continues to be informed and infused with creative thinking and activism that arises from outside its own self-referenced world . In this way it will avoid stagnation in thinking and action and continue to exhibit hybrid vigour that can respond to a rapidly changing world. This inclusive mentality that acknowledges like minded concepts and networks reduces the problems of “turf warfare” between pioneering concepts that colonise the psycho social margins of mainstream society. This holistic “jack of all trades” scope of permaculture needs to be balanced by a “mastery of one”. For each of us the calling and contribution to a better world will be many and varied. My hope is that enough permaculture practitioners dedicate their lives to making the founding permaculture vision of truly productive bioregional tree crop agricultures a reality able to survive the rigours of climate change and energy descent. Can we do the hard yards such that reality can match the rhetoric? Or take part and learn in the Permaculture Design Certificate course.